Ippudo had already proven to me their consistency, both locally and internationally. 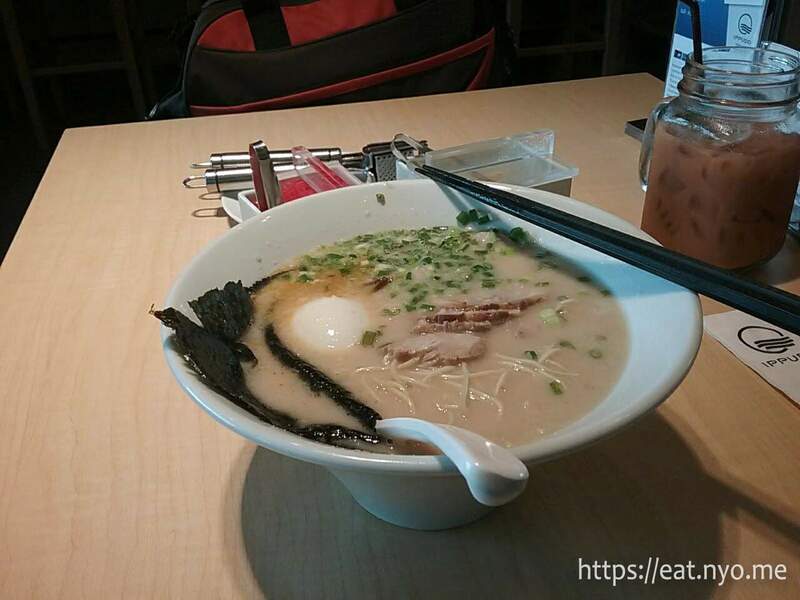 We tried almost all the local Ippudo branches and all of them have been quite consistent. We’ve been eating here regularly, perhaps once every one or two months, and the only time I can recall there was a lapse in consistency was the bit-too-tough pork in Eastwood one time that they managed to fix on our next visit. The consistency was also proven overseas when my Betrothed and I had Ippudo in Singapore and I had the opportunity to try it out in Sendai. Sure, there were some minor differences and some local specialties, but overall, the experience was quite similar. Megabangna Thailand’s Ippudo had a much more interesting menu. For one, they serve Ippudo Zero as a regular item, it seems. There were also some “half ramen” offerings where the prices and I assume quantity is also halved. These can come in a “meal” with gyoza and drinks, and don’t break 200 Baht. Finally, they also have some limited offerings, specifically the Wakayama Ramen which was a pork, chiken, and fish broth. That didn’t really sound appetizing to me, so I stuck with my favorite Shiromaru Special (280 Baht). Despite the language difficulty, I managed to order the noodles very hard. Their drinks were also quite unique, with a lot of fruit juices and local drinks. I ordered their Thai Iced Tea (70 Baht) as my quencher. 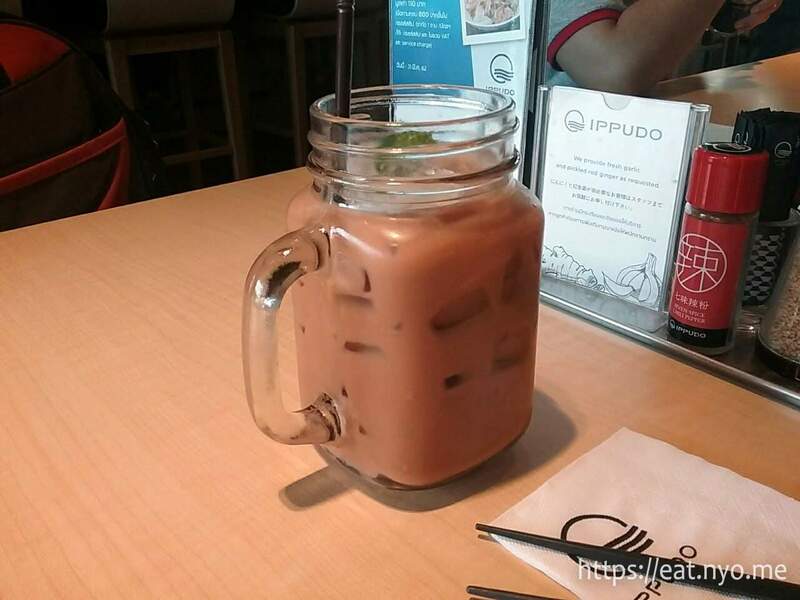 The Thai Iced Tea arrived in a mason jar. If you’ve had Thai Iced Tea before, you’ll know how it’d taste like. I don’t drink as much as my Betrothed, but I reckon this iced tea is a bit less sweet than what we have locally, at least, from most of the places that she’d order from and let me sip. The Shiromaru Special arrived shortly after. Sipping the broth confirmed that this was indeed an Ippudo product. It was the same broth with similar toppings—nori, egg, spring onions, pork, bean sprouts, and kikurage mushrooms. One slight difference I found was with the noodles. While it was still quite firm and thin, it had a bit of a raw wheat flavor. Another difference was that the pork was much less fatty and was much more neutral tasting, with almost no taste of smokiness. The table didn’t have the signature garlic cloves, but I was able to ask for it despite the slight language difficulty. Adding in a couple of cloves made my Shiromaru much more enjoyable and felt more homey for me. After service charge and taxes, I paid a bit more than 410 Baht. Converted, that’s around 670 Php. It is a bit more expensive than what we pay locally, but then again, I did order drinks. Without that, I think the Shiromaru Special is priced similarly. Anyway, although this place was not as consistent as what we have locally vis-à-vis Singapore/Sendai, it’s still definitely an Ippudo experience. The balanced tonkotsu broth was similar as were most of the toppings. Oh, and this place also has budget options. I think that’s something that our local branches can adapt for our more budget-conscious gourmands. While still definitely more expensive than a typical meal in Thailand, and it’s something I’d definitely not recommend to other travelers (go try actual local Thai food! ), I found my visit to Ippudo worth it. Not recommended for: Budget travelers. Smart nomnomnom tip: Maybe try their limited or budget offerings.